trademark for a preparation of hydrocortisone enema, used in treatment of ulcerative colitis. Suppresses adrenal function at chronic doses of 20 mg/day. Replaces endogenous cortisol in deficiency states. Also has potent mineralocorticoid (sodium-retaining) activity. Absorption: Well absorbed following oral administration. Sodium succinate salt is rapidly absorbed following IM administration. Absorption from local sites (intra-articular, intralesional) is slow but complete. Distribution: Widely distributed, crosses the placenta, and probably enters breast milk. Half-life: 1.5–2 hr (plasma), 8–12 hr (tissue); adrenal suppression lasts 1.25–1.5 days. Contraindicated in: Active untreated infections (may be used in patients being treated for tuberculous meningitis or septic shock); Lactation: Avoid chronic use; Known alcohol, bisulfite, or tartrazine hypersensitivity or intolerance (some products contain these and should be avoided in susceptible patients). Use Cautiously in: Chronic treatment (will lead to adrenal suppression; use lowest possible dose for shortest period of time); Pediatric: Chronic use will result in ↓ growth; use lowest possible dose for shortest period of time; Hypothyroidism; Cirrhosis; Ulcerative colitis; Stress (surgery, infections); supplemental doses may be needed; Potential infections may mask signs (fever, inflammation); Obstetric: Safety not established. Additive hypokalemia with thiazide and loop diuretics, or amphotericin B.Hypokalemia may ↑ the risk of digoxin toxicity.May ↑ requirement for insulin or oral hypoglycemic agents.Phenytoin,phenobarbital, and rifampin ↑ metabolism; may ↓ effectiveness.Oral contraceptives may ↓ metabolism.↑ risk of adverse GI effects with NSAIDs (includingaspirin ).At chronic doses that suppress adrenal function, may ↓ antibody response to and ↑ risk of adverse reactions from live-virus vaccines. Oral (Adults and Children > 12 yr) 20–240 mg/day in 1–4 divided doses. Oral (Children) Physiologic replacement—0.5–0.75 mg/kg/day or 20–25 mg/m2/day divided q 6 hr.Anti-inflammatory or immunosuppressive—2.5–10 mg/kg/day or 75–300 mg/m2/dayin 3–4 divided doses. 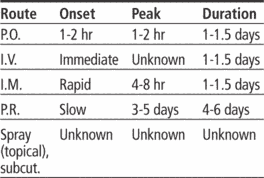 Oral (Neonates) Congenital adrenal hyperplasia—10–20 mg/m2/day in 3 divided doses. Oral Intravenous (Neonates) Refractory hypoglycemia—5 mg/kg/day divided q 8–12 hr or 1–2 mg/kg/dose q 6 hr. Rectal (Adults) Retention enema—100 mg nightly for 21 days or until remission occurs. Intramuscular Intravenous (Adults) 100–500 mg q 2–6 hr (range 100–8000 mg/day). Intramuscular Intravenous (Children and Infants) Adrenocortical insufficiency—1–2 mg/kg/dose bolus, then 25–250 mg/day in divided doses q 6–8 hr. Anti-inflammatory or immunosuppressive— 1–5 mg/kg/day or 30–150 mg/m2/day divided q 12–24 hr; Physiologic replacement—0.25–0.35 mg/kg/day or 12–15 mg/m2/day once daily;Shock—50 mg/kg bolus then 50 mg/kg as a 24 hr infusion. Intravenous (Neonates) Bronchopulmonary dysplasia prevention in preterm neonates with prenatal inflammatory exposure—1 mg/kg/day divided q 12 hr during the first 2 weeks of life; Refractory hypotension—3 mg/kg/day divided q 8 hr x 5 days. Indicated for many conditions. Assess involved systems prior to and periodically during therapy. Assess patient for signs of adrenal insufficiency (hypotension, weight loss, weakness, nausea, vomiting, anorexia, lethargy, confusion, restlessness) prior to and periodically during therapy. Monitor intake and output ratios and daily weights. Observe patient for peripheral edema, steady weight gain, rales/crackles, or dyspnea. Notify health care professional should these occur. Children should have periodic evaluations of growth. Rectal: Assess symptoms of ulcerative colitis (diarrhea, bleeding, weight loss, anorexia, fever, leukocytosis) periodically during therapy. Lab Test Considerations: Systemic—Monitor serum electrolytes and glucose. May cause hyperglycemia, especially in persons with diabetes. May cause hypokalemia. Monitor hematologic values, serum electrolytes, and serum and urine glucose routinely in patients on prolonged therapy. May cause ↓ WBC counts. May cause ↓ serum potassium and calcium and ↑ serum sodium concentrations. Guaiac test stools. Promptly report presence of guaiac-positive stools. May cause elevated serum cholesterol and lipid values. May cause ↓ uptake of thyroid 123I or 131I. Suppresses reactions to allergy skin tests. Do not confuse hydrocortisone with hydrocodone. Do not confuse Solu-Cortef with Solu-Medrol (methylprednisolone). If dose is ordered daily or every other day, administer in the morning to coincide with the body's normal secretion of cortisol. Periods of stress, such as surgery, may require supplemental systemic corticosteroids. Oral: Administer with meals to minimize GI irritation. Tablets may be crushed and administered with food or fluids for patients with difficulty swallowing. Intramuscular: IM doses should not be administered when rapid effect is desirable. Do not dilute with other solution or admix. Reconstitute with provided solution (i.e., Act-O-Vials) or 2 mL of bacteriostatic water or saline for injection. Rate: Administer each 100 mg over at least 30 sec. Doses ≥500 mg should be infused over at least 10 min. Intermittent Infusion: Diluent: May be added to 50–1000 mL of D5W or 0.9% NaCl. Concentration: Usual 1–5 mg/mL. Adults who are fluid restricted may received up to 60 mg/mL. Rectal: Position patient on left side and administer nightly for 21 days. Enema should be retained for at least 1 hr and preferrably all night. May use sedatives and antidiarrheals to facilitate retention. Instruct patient on correct technique of medication administration. Advise patient to take medication as directed. Take missed doses as soon as remembered unless almost time for next dose. Do not double doses. Stopping the medication suddenly may result in adrenal insufficiency (anorexia, nausea, weakness, fatigue, dyspnea, hypotension, hypoglycemia). If these signs appear, notify health care professional immediately. This can be life-threatening. Corticosteroids cause immunosuppression and may mask symptoms of infection. Instruct patient to avoid people with known contagious illnesses and to report possible infections immediately. Review side effects with patient. Instruct patient to inform health care professional promptly if severe abdominal pain or tarry stools occur. Patient should also report unusual swelling, weight gain, tiredness, bone pain, bruising, nonhealing sores, visual disturbances, or behavior changes. Advise patient to carry identification describing disease process and medication regimen in the event of emergency in which patient cannot relate medical history. If rectal dose used >21 days, decrease to every other night for 2–3 weeks to decrease gradually. Improvement in symptoms of ulcerative colitis. Clinical symptoms usually improve in 3–5 days. Mucosal appearance may require 2–3 mo to improve.